If you’ve been a follower of Christ for a while you have probably encountered believers who, in the excitement of learning, become harsh towards fellow believers who don’t measure up in their newly opened eyes. The effort to impart wisdom to these individuals can be draining for those who have mastered a bit more of the ropes of this Way. Draining because it can be difficult to get a point across, and also because you see the error in their ways and know you must tread carefully; the last thing we want to do is hurt or discourage fellow believers, especially babes. On the other side of this coin are believers who claim to have a number of years under their belt but who seemingly have not moved beyond the basics. They don’t realize that doing and saying certain things hurts the Body. Errant living, from how we treat others to the things we allow can be a stumbling block for new believers (Rom 14:13), and make the job harder on those who get asked the difficult questions regarding someone else’s behavior. Sigh. I get caught in the thick of things sometimes as I’m asked to answer for the actions of others. (How do you get an injured person to love and forgive Bro. Snooty who always finds fault if one doesn’t agree with him– to the point of purposefully trying to make them look bad in front of others?) At times I am tasked with trying to get believers (often new) to understand the times we are living in, how we are supposed to walk – despite what others do, and encourage them not to be so hostile regarding others etc. It is not always easy because often, when people are so critical of others, they fail to realize they are actually walking in disobedience themselves. Another difficulty can be finding the words to be honest without also being harsh. Trying to get them to understand that we have to love one another, irritable qualities and all – just as we want/love despite our own imperfections – isn’t always easy but it’s necessary. We must love one another. For a more in depth look at love please check out love 1, and love 2. Love is what is missing amongst believers today. I have heard new converts – after a few weeks of Bible reading – let loose a number of scathing censures against their fellow believers, including their pastor. They make their comparisons and speak of them with contempt, not realizing that their hostility towards their fellow believers in itself reveals a lack of love on their part. There have been times, when disgust regarding someone or the unyielding censure of another is pouring forth, that I’ve asked the question, “Have you prayed for them.” The usual answer I get, after a pause, is “no.” This is true for new converts and “seasoned believers” alike. This is wrong. We can all look at the church today and see the difference in the church of 50 years ago. We can definitely see glaring differences between today’s church and that of 100 + years ago. Comparing today’s church with that started by the Disciples? We would have to say it’s no contest, the early church wins. The truth is each era has its share of disobedience, weak converts, fence straddlers, attachments to the world etc. Each era also has its share of those who saw/see the problems and addressed them. Wherever human beings are there will be issues. New convert? Love the brethren. Old convert? Love the brethren. Why is it that we practically crucify another believer for needing growth in the same area we once needed growth in? We treat them like they are committing the seven deadly sins and want nothing to do with them because they watch a certain program on TV or haven’t yet grasped the importance of the company they keep. We don’t have a thimbles worth of love to pray that God opens their eyes? We don’t have a modicum of honest compassion that will keep us from deeming them beneath our “high and mighty” selves? Why is our skin so thin that we can’t bear for another to tell us we are veering left in our words or actions? Do we really believe we are that infallible? Packing this foolishness, we are on our way to heaven, right? Wrong! Take time to develop your walk with God. Follow His Instructions. Do not worry about who may or may not be following to the letter; you follow to the letter. Focus on your walk. Do not get distracted by what may or may not be going on around you. Develop a heart of true love, according to 1 Cor 13) for all people, especially those of the household of faith (Gal 6:10). Let the Fruit of the Spirit develop in your heart. If your pastor is not a heretic, if he does not teach against the Word of God, then slow your roll. If your pastor is not a false prophet, and if he does not refuse to preach truth then settle down, and be thankful for the pastor you have. In this day and time it is growing harder and harder to find good pastors who preach the truth and provide sound counsel. Whether you think he should shoot fire and brimstone from his mouth or not, if he is not lying to you then you are blessed! Know this: If your pastor is teaching and living the truth, if he is leading by and upholding the Word of God (doesn’t let known SIN go unchecked) then you cannot blame him for the seeming disobedience of a wayward church member. Go back and read some of Paul’s letters. No one would argue that Paul was one great man of God. It was not Paul’s fault that some professing believers of the congregation were doing ungodly things. From the early church to today’s church there have been and will be the disobedient, the hypocrite, and the weaker ones who occasionally just don’t “get it.” Oftentimes church complaints have nothing to do with blatant sin anyway, but more to do with petty stuff and those little foxes. Don’t fall into the trap of sitting in the seat of the censorious regarding your church. Believe me; the church does not need any more of that. Develop the habit of prayer. We waste a lot of time getting angry/frustrated/worried when we should be casting our cares. Someone ticks you off? Pray. You see things you don’t understand. Pray. You see a believer saying or doing something you know or feel to be wrong. Pray. Sometimes prayer is our best weapon in regards to the enemy’s attack on our siblings in Christ. Sometimes through prayer God will give you what to say to/do for them (and how) or maybe He will address the issue through the pastor, etc….When we pray for one another we stand in the gap; we go to bat for them in the heavenlies. Sometimes we can see the danger before they do; we can often see issues they just don’t recognize in themselves, and vice versa. We have to pray for the Body of Christ. Too often we talk too much and have no discretion. How many times have we uploaded our pet peeves, criticisms, dislikes and gossip about another to the heart and mind of a weak believer? Now they can’t look at their brother/sister or leader right because we have corrupted their view! The individual may have repented, but this weak believer is still views them sideways because they can’t get past what we have filled their head with against them. God is NOT pleased with this! He is also not pleased with our talking to/about others with no regard for their feelings; using our words and attitude to injure our brother/sister – not caring enough for their heart to even give it a thought. Memorize the definition of MERCY and CURSE. Why? Because if we don’t show mercy to others we will not receive mercy from the Lord (James 2:13). We are also not to curse others (James 3:8-10). Are your thoughts and actions toward others – especially those “repeat offenders” – merciful or unmerciful? Are your words those of cursing or blessings? In a building or under a tree, you gather WITH the church – and there is NO “PERFECT” CHURCH here on this earth. So when you get ants in your pants and don’t want to go for this reason or that, or want to find yourself a few you deem “worthy” of your fellowship and call it a day – stop. Do not fall for the okeedoke; it’s a trap [see #2 & 3]. If GOD leads you to join a non-traditional gathering then so be it, but HE has to make that call. And, guess what, you will still be “going to church.” Remember, where people are there will be issues…be the group small or large. What are you going to do when the denigration bug bites again in your new sans-official building gathering? There is NO “PERFECT” CHURCH this side of heaven. GO TO CHURCH. The more you miss church the more you will come to feel you do not need to go. You will develop an attitude of take it or leave it – then eventually, just leave it. This is dangerous, because – whether you realize it or not – there is a purpose for attending church . Families get to know each other over time. I’m the firstborn in a family of 8 kids. What if I didn’t want to get to know my siblings? What if I always made sure I had something “better” to do so I wouldn’t have to spend time with them? What if I didn’t care if they were starting to do something that could make them weaker or cause them to fall into disobedience as they grew? What if every time you came around I made it a point to unload every fault I think I “discern” in them and everything that gets on my nerves about them? What if every time you mentioned one of them to me I scoff and looked as though the very mention of their name turned my stomach? Would you say I loved my siblings or hated them? How would my parents feel if they witnessed this one day? How would my siblings feel if they happened upon my ridicule? It is the same thing with our church family. How do we think God feels about how we view and treat one another? Something to think about isn’t it?! The very ones we *think* we have no need for are often the very ones required for our own development and progress in The Way. We cannot discount our fellow believers. We NEED each other, even if it’s to learn how to love difficult people. It is a strategy of the enemy to get us to feel that we don’t. I pray that we continually inspect our treatment of others – in word, thought, and deed – to ensure we really love them as Christ commands us to. Wise counsel you are giving here! 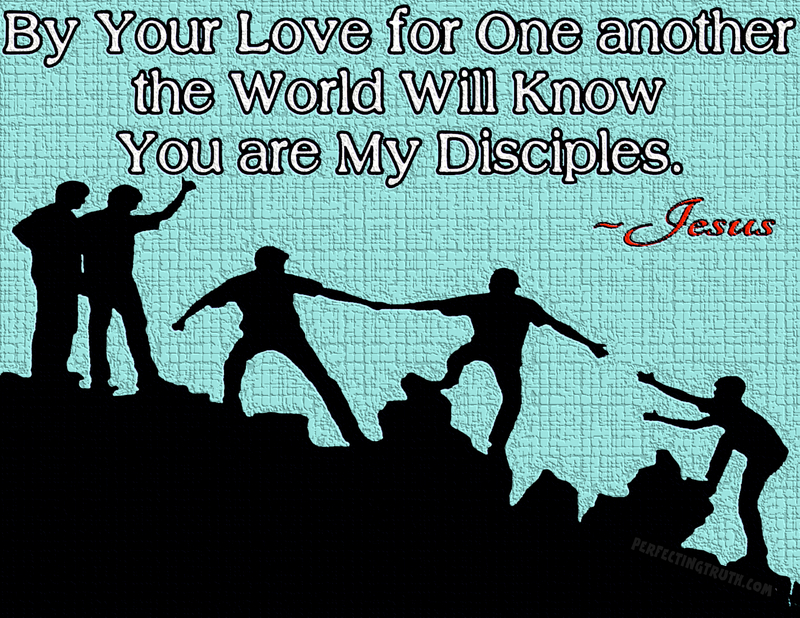 May the world know we are Christians by our love. God bless you, Juanita! Thanks for taking time to read and comment on the post (I know its a bit long this week). I believe we must return to the foundation Christ set, and the biggest part of that love for each other. God bless you! I praise God for your heart, your words and your ministry! May you continue to stay true to God’s Word and the supremacy of Christ. He is our hope and our salvation!